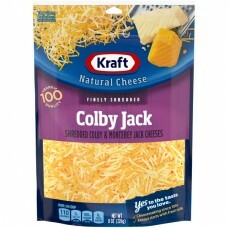 Kraft Finely Shredded Natural Cheese Colby Jack. 100 Years of quality. Shredded colby & monterey jack cheeses. Yes to the taste you love. Cheesemaking since 1914. Always starts with fresh milk. Per 1/4 cup: 110 Calories. 5g Sat fat, 26% DV. 180mg Sodium, 8% DV. 0g Total sugars. Net Wt 8 oz (226 g). Kraft - Family greatly. Contains 0g of lactose per serving. Call: 1-800-634-1984, have package available. Visit: www.kraftheinzcompany.com. © Kraft Foods. Keep refrigerated. Once opened, use within 5 days.